No matter the cause, mold is something to take seriously. It can spread very quickly, and become hazardous to your health, and that of your family. Mold can appear and grow anywhere in your home, but it all needs addressing immediately. Sometimes the mold can be the result of a catastrophic event, like a flood in your home. 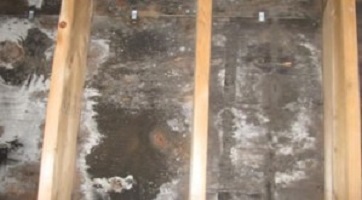 Sometimes mold can build gradually over time. It only takes a small amount of moisture in your home for mold to take hold. Once there, however, mold grows rapidly. It can cause damage to your home as well as your health. Mold can cause rotting, and structural damage. If you suspect your home has serious levels of mold, you need the services of a mold remediation company. If you can see mold, or even suspect mold is present, you need professional help. Don’t delay, call a Scotch Plains mold remediation company immediately. One of the most naturally damp places in your home is the basement. These areas are prone to moisture as they are below grade. Flooding can easily occur at the basement level, because water moves along the basement walls. Make sure to keep gutters clear, so water can flow freely away from your home. After a large rain fall, or heavy snow fall, make sure water is not seeping into the basement. Periodically check along basement walls, windows and baseboards for sign of mold. If you see mold in your basement, call a professional to prevent the mold from spreading. Mold does not always start at the basement level. All mold needs is moisture to grow and spread. Any cracks in roofing materials, flashings, and masonry can allow moisture into your home. If you see damp spots inside attics, or along ceilings or walls under the roof line, you probably have a roof leak. This allows moisture to seep into your home. Other signs of moisture include peeling wallpaper and dark patches on the ceiling. This dampness and unwanted moisture can become the perfect conditions for mold to grow in. You need specialized mold remediation for this kind of problem. The best way to deal with mold is to try to prevent it from becoming too big a problem. Make sure to thoroughly clean gutters to keep water from flowing along the basement walls, where it can seep in. Inspect basement exterior walls for cracks where moisture can get in, and become problematic. Keep basements at a fairly constant temperature and keep the humidity in check. Try not to clutter basements too much, to allow for free air flow. Keep your roof in good condition. Regular inspections can prevent damaging leaks, or catch them before they become a bigger problem. Your home is your biggest investment, so of course you do your best to maintain it. Even with the best preventative measures, however, mold can still happen. You can never plan for flooding, and it can cause devastating results, and leave mold growth behind. Unfortunately, leaks in attics and basements don’t make themselves known until there is damage. If you see signs of mold in your attic or bedrooms, call a professional. You need the services of a mold remediation company that treats mold from top to bottom. Early detection and speedy action are vital for preventing the spread of mold. To safely get rid of any mold in your home, and prevent any further growth, you need to act quickly. Call a Scotch Plains mold remediation specialist for immediate help.